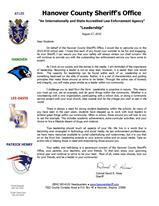 On behalf of the Hanover County Sheriff’s Office, I would like to welcome you to the 2015-2016 school year. I hope that each of you found your summer to be fun and engaging. As your Sheriff, I can assure you that your safety will always remain our chief concern. We will continue to provide you with the outstanding law enforcement service you have come to expect. As I look at our society and the stories in the media, I am reminded of the importance of leadership. Becoming a leader is not an easy task; however, it is easier than one would think. The capacity for leadership can be found within each of us. Leadership is not something bestowed on the elite of society. Rather, it is a set of characteristics and guiding principles that make those around us strive to be better. Through the active use of honesty and integrity, you will make great strides as a leader within our community. I challenge you to lead from the front. Leadership is proactive in nature. This means you must go out, set an example, and do good things within the community. Whether it is volunteering with a civic organization, participating with a school club, or doing a community service project with your local church, step outside and be the change you wish to see in the world. There is always a need for strong student leadership within the schools. As many of you have seen in the past years, students have stepped up to work with local leaders to achieve great things within our community. When in school, those around you will look to you to set the example. This includes academic achievement, extra-curricular activities, and your choice to live a lifestyle absent of drugs and violence. True leadership should touch all aspects of your life. We live in a world that is becoming ever entangled in technology and social media. As law enforcement professionals, we have many resources available to curtail cyberbullying and cybercrimes, but it is you that sit on the front line. Leadership extends to your actions online and on social media. Take an active role in helping those in need and empowering those around you. Your safety and well-being is a paramount concern of the Hanover County Sheriff’s Office, your parents, your teachers, and your friends. To that end, enjoy your upcoming school year and continue to strive to be your best. Most of all, make wise choices, look out for your friends, and be a leader in your community!